2015 holiday gift guide! For home decor, books, kids, and yourself! 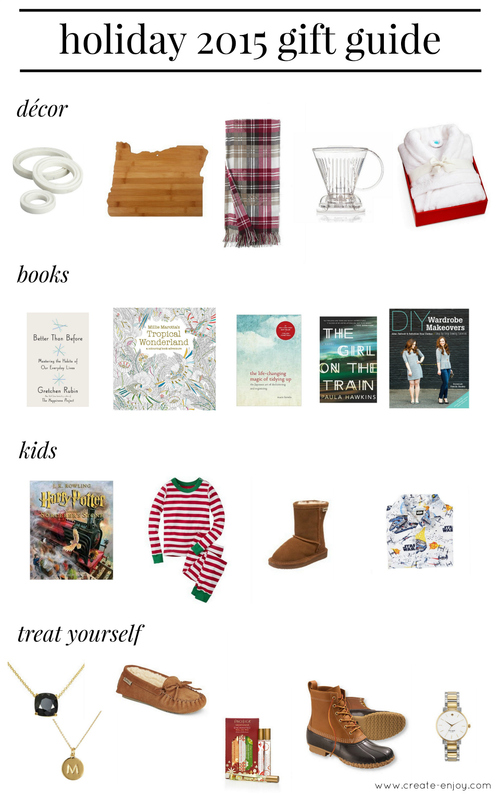 It was a lot of work but so fun putting together this gift guide! I'm a pretty practical person and gift-giver so I'm not drawn to all the perfume sets, fleece blankets, and small, specialized kitchen appliances I see in ads this time of year--does the person really need those??!? is always my concern. But there are definitely some things that I see that I know certain people on my list would like. (Or I would like, for sure.) I hope it's helpful! Last year I put together "practical person's gift guide"s--this one for books, this one for kitchen goodies, and this one for the practical stuff/basics (like this amazing enameled cast iron skillet, a must have IMHO). This year I grouped all my recommendations into one, even easier for you! A special cutting board! I love these in the shapes of the states. Everyone has cutting boards already, sure, but they do get old and your gift recipients may love getting a new one in the shape of your favorite/shared place! A really soft plaid throw. We got one just like this also from Lands' End last year, and it's the nicest throw I've owned and is so wintery and festive! A classy plush robe like this one. Robes are one of the things I never buy myself. If your gift recipients are like me... this would be a great gift! Clever Coffee Dripper. My mother-in-law heard about this and bought me one for my birthday. It's so genius! You need less of the coffee grounds since it steeps in them before dripping through. I do mine for 4-5 minutes and have delicious, strong coffee (though I use decaf, but I still like it to taste strong!). An awesome gift!! Better than Before (or hardcover). I will never stop recommending Gretchen Rubin's books. (The Happiness Project changed my life!) Better than Before came out this year and is all about habits and the four tendencies of people--so why some of us do better with different strategies for forming and keeping good habits. I really identify with how she explains things and has improved her own life, and her work (she has a great podcast now, too) has really helped me! I highly recommend this book--for yourself or a gift! An adult coloring book!! Need I say more? Tropical World: A Coloring Book Adventure. What a great way to spend the rest of your holiday break after receiving that book, right? The Life-Changing Magic of Tidying Up. This book has been wildly popular and appeals to so many people, even those with less interest in housekeeping! It has a very positive take on "tidying up" rather than punitive. It's inspiring! DIY Wardrobe Makeovers. Of course I recommend my book as a gift!! It's great for any level of sewing enthusiast, from beginners (there are basic tips) to pros who don't do a lot of mending to their own clothing. I'm so grateful for the support I've received so far from my readers, and just wanted to throw in a reminder that if you know someone who's interested... please think of it! Harry Potter and the Sorcerer's Stone: The Illustrated Edition!!!! Why has it taken so long for this to be invented? I flipped through this at a bookstore the other day and was so hooked. Beautiful illustrations bring it to life and would be a great way to get younger kids into these wonderful books. Star Wars flannel jammies! Everyone's excited about Star Wars right now. How about the classiest possible Star Wars merch? These flannel jammies are amazing. My fave practical but beautiful gifts! A really pretty necklace. I love this one! (Matching earrings.) A monogram necklace is also a really sweet, personal gift. Pacifica all natural perfumes. I love this stuff. Super short ingredient list and the fragrances are all so fresh and natural. It's hard to pick just one so this trio of roll-ons is great! Real leather/shearling slippers. Not the "sueded" polyester fabric kind with poly fur inside, no, real leather moccasins or scuffs. Real leather/fur ones last so much longer but also don't get the stinky feet smell the way fake ones do! If you (or your recipient) has never owned real ones, it's time for a treat. And they don't have to be a designer brand to be nice! These from Macy's are a great price on sale this season. Duck boots (real deal, usually backordered/affordable option 1/affordable option 2/affordable option 3). I've wanted nice ones of these forever and now they're trendy so there are a lot more options! Great cozy, super practical gift! I just got some and have already worn them for picking out our Christmas tree! Hope these ideas are helpful! Happy gifting! !